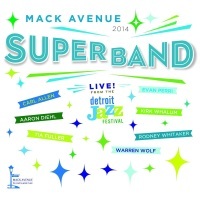 Live From the Detroit Jazz Festival – 2014 documents the third incarnation of the Mack Avenue SuperBand, an all-star ensemble of bandleaders from the superb roster of the Motor City jazz label. Once again, this powerhouse congregation joined forces under the leadership of bassist Rodney Whitaker to dazzle a hometown crowd in picturesque Hart Plaza, with the results captured for another knockout live recording. Joining Whitaker as three-time veterans are his longtime rhythm section partner, drummer Carl Allen; pianist Aaron Diehl; and guitarist Evan Perri of Hot Club Of Detroit. Alto saxophonist Tia Fuller returns from the SuperBand’s debut outing after taking the second year off, while vibraphonist Warren Wolf and tenor saxophonist and longtime SoulTracks fave Kirk Whalum make it two in a row after joining the band for the first time in 2013. Each year The SuperBand's performance is a highlight, and this year is no exception. We are extremely proud to present Live From the Detroit Jazz Festival - 2014 as our newest SoulTracks Listening Room. For fans of great music, superbly played, this collection is yet another must have. Listen below and enjoy! Whitaker, the music director, reaches out to each musician to solicit their contributions to the year’s repertoire. Of the half-dozen tunes on this year’s release, all but one were written by members of the SuperBand. The exception is Herbie Hancock’s “Riot,” which kicks off the album in combustible fashion with fiery solos from Wolf, Perri, Diehl, Whitaker, and Allen. The music director, who has two co-led albums with Carl Allen on the label along with his own 2014 release When We Find Ourselves Alone, contributes “A Mother’s Cry,” the theme song from his score to the PBS documentary “Malawi & Malaria: Fighting to Save the Children.” Despite the darkness of the theme, the song retains a hopeful melodicism and is highlighted by Whitaker’s meditative solo bass intro and a solo that passes among most of the band members, with a keening sense provided by Fuller on soprano and Whalum on flute. Perri and the Hot Club of Detroit have released four albums of Djangology on the label, and “For Stephane” is prime evidence of his ability to take his gypsy jazz influences and transform them into his own distinctive take on modern jazz. The tune’s shifting time signature spurs intricate playing from Wolf and Perri. The set draws to a close with Kirk Whalum’s “Bipolar Blues Blues,” which may come as a surprise to those who know the saxophonist only in his smooth jazz guise. Whalum’s Mack Avenue discography includes homages to soul icons Babyface and Donny Hathaway, the collaboration of John Coltrane and Johnny Hartman, and the conjunction of gospel and jazz. Here, his tenor duels with Fuller’s soprano on a down-home blues that feels right at home on the streets of Detroit. By the time this set draws to a close, listeners at home may feel transported to the city, or at the very least feel some of the excitement that the Hart Plaza crowds were swept up in last August.